Our range of post mounted aluminium composite church signs are manufactured from high quality 3mm aluminium composite sheet which using the latest technology can be CNC profile cut to almost any shape or size. Our post mounted church signs can be produced to any one of our 26 standard background colours or full colour printed graphics applied. The rear of the signs are a traffic grey finish as standard and have post fixing rails securely attached to the rear of the sign panel. 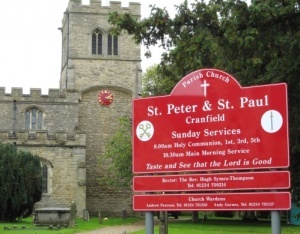 Our post mounted church signs are supplied with factory coated grey aluminium posts as standard but we offer an optional range of powder coated aluminium posts and decorative ball finials to further enhance your new signs. 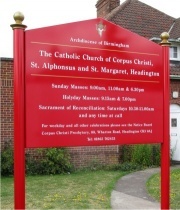 Why Use Aluminium Composite for your New Church Signs ? Aluminium composite (ACM) is an alternative material to aluminium that is used in the production of internal and external signage and displays. Widely used in many commercial applications ACM is formed from two thin layers of aluminium which are then bonded to form a sandwich with a low density polyethylene core. The finished sheet is lightweight yet durable and is ideal for long term wall mounted signage applications. 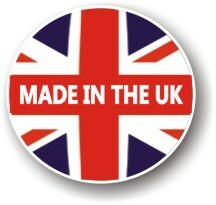 As standard our posts are supplied in a factory applied grey paint finish. 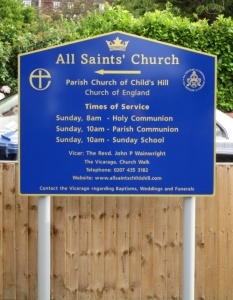 To enhance the look of your new church signage we offer a powder coating service where you can choose from white powder coated aluminium posts or coloured powder coated aluminium posts to match or contrast with your sign panel. Some suppliers may offer you factory finished white posts which has a grey tinge to them but our posts are individually powder coated to give you a high quality bright white gloss finish. 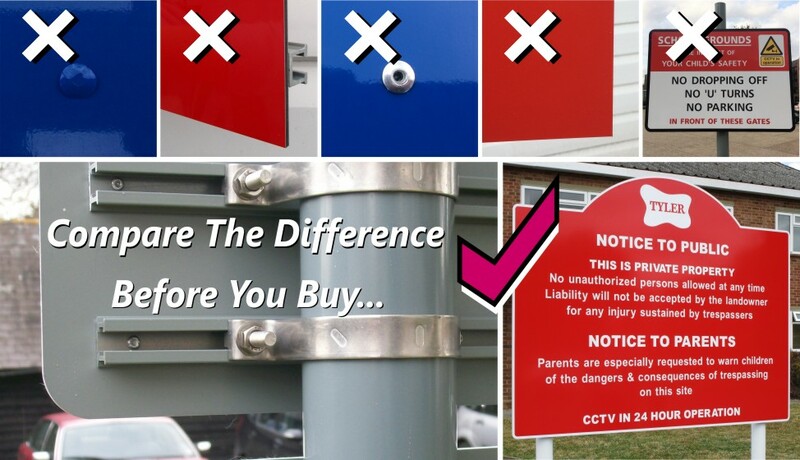 Our smaller signs are supplied with 1 x 50mm diameter grey painted post 2,500mm length and our larger signs 2 x 76mm grey painted aluminium posts 3,000mm in length. We appreciate that at times longer posts are required ie if your sign is to be sited behind a brick wall, hedge or fence. In these instances we offer a range of post dimeters and post lengths to suit. If you need any help deciding if your posts will be long enough please do not hesitate to contact us for further information. 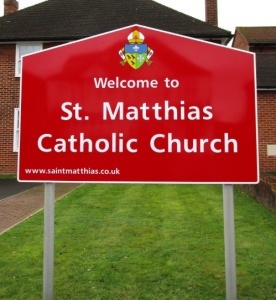 We are proud of the quality of our post mounted flat plate aluminium composite church signs. Like any company we are human and mistakes do occasionally happen but our team will try 100% to ensure that every church sign that leaves our workshops is of the highest possible quality. Price is a huge factor to be considered before purchasing new church signs but so is safety and quality. We believe that it is very important that our customers compare the difference between our church signs and any other proposals they may have received before placing their order. 1/ Our post mounted flat plate church signs have a smooth face & DO NOT have any unsightly fixings or rivets through the face of the signs. 2/ It is IMPORTANT that sign rail fitted to the rear of the sign is recessed & not flush to the edge of the sign to avoid protruding sharp edges. 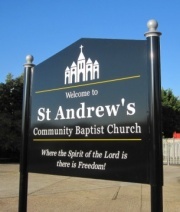 3/ Our church signs are supplied with radius corners NOT square corners to avoid dangerous sharp edges. 4/ We only use Aluminium Posts NOT Steel Posts - Steel posts are heavy, do not flex and will eventually rust and need replacing. 5/ Aluminium Posts should give the maximum support and be cut to the correct length and NOT protrude above the sign panel. 6/ If additional sign slips are required they have 2 sign rails to the rear NEVER only 1 sign rail with any fixings through the face of the sign. As well as powder coated coloured aluminium posts we offer a range of powder coated cast aluminium decorative ball finials which can be used to further enhance the appearance of your church signs. Instead of the standard post end caps the ball finial fits securely on the end of your 76mm diameter aluminium post and is fitted securely in place by tightening the discrete bug screws that are supplied with the finial. The ball finials are supplied in the same powder coated colour as your posts or a contrasting colour for that extra finishing touch. 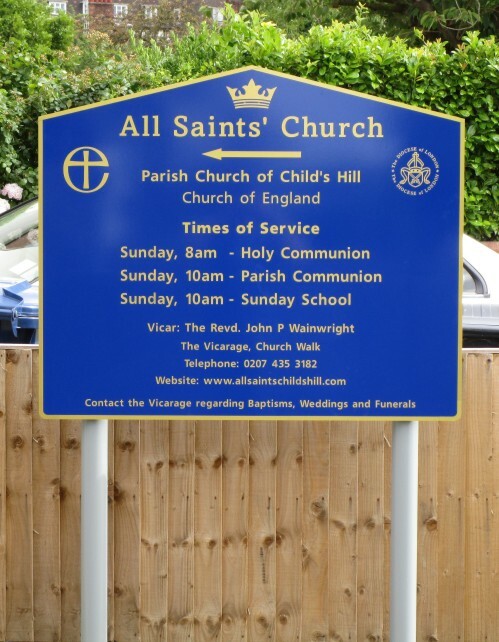 Small Aluminium Composite Post Mounted Church Signs - Come complete with a single 50mm diameter grey painted aluminium post 2,500mm in length, post end cap, sub-surface anti-rotational base plate and stainless steel post fixing clips as required. 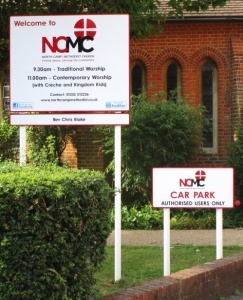 Medium Aluminium Composite Post Mounted Church Signs - Come complete with a single 76mm diameter grey painted aluminium post 3,000mm in length, post end cap, sub-surface anti-rotational base plate and stainless steel post fixings clips as required. 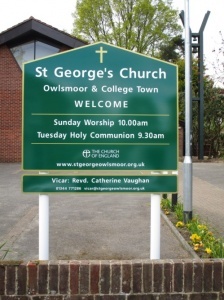 Large Aluminium Composite Post Mounted Church Signs - Come complete with 2 x 76mm diameter grey painted aluminium posts 3,000mm in length, 2 x post end caps, 2 x sub-surface anti-rotational base plates and stainless steel post fixings clips as required.